The Teko Infinity women's hiking/walking socks are part of Teko's Merino Sin3rgi range, which makes socks from a mixture of Merino wool and recycled plastic. Recycled polyester drinks bottles are gathered, spun and dyed in Turin, Italy, and are then transported to Venice where the polyester and Merino fibres are knitted into socks. The Teko Infinity is perfect for hiking, walking and running. 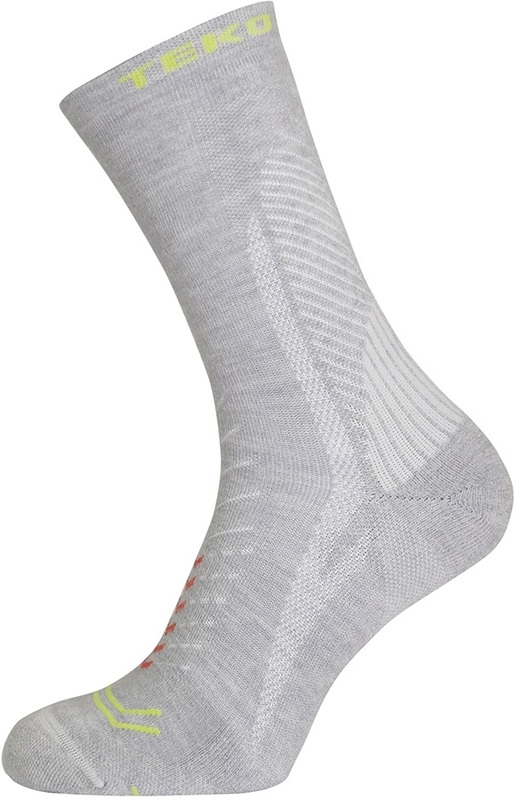 It is a lightweight, cushioned crew with a sleek, snug design and next-to-skin comfort. The Merino wool will keep your feet warm and cosy, but it also works with the polyester fibres to quickly wick away sweat so that your feet stay dry. The Infinity's assymetric ergonomic fit and seamless toe enhances comfort, while the reinforced toe and heel means that these socks will just keep on going.